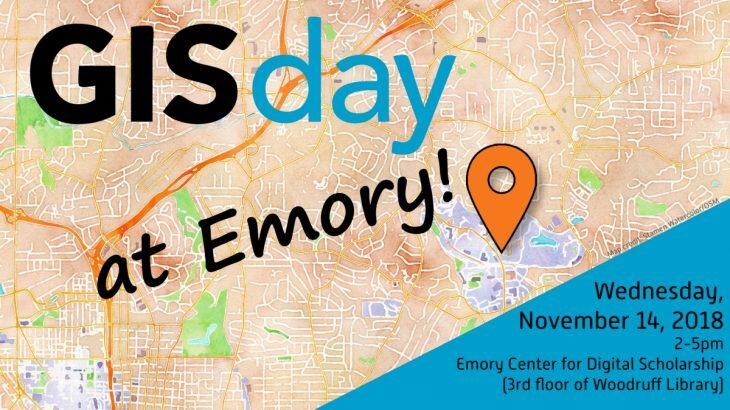 Join GIS experts Megan Slemons and Michael Page for the Emory Center for Digital Scholarship GIS Day celebrations Wednesday, November 14, from 2-5pm. Learn about GIS, mapping, and spatial data resources and happenings at Emory. We will have a hands-on workshop with Esri Story Maps and geospatial technology demos (including drones!) in the Digital Lab. Come for the maps and demos and stay for the GIS Day cake, refreshments, and networking. events ECDS, Esri Story Maps, Event, geo-spatial, GIS, GIS Day, story maps, workshop. permalink.